All it takes to edit a video is a shake of your iPhone. Modern smartphones do everything you could possibly want, and that includes shooting great high-definition video. But if you’re a risk-taker who prefers to ski down the side of a mountain, skydive from a plane, or generally live life on the edge, it’s a good idea to leave that iPhone in your pocket. Enter the action cam: Tiny, affordable cameras designed to go wherever weekend adventures might take you. Build to withstand the weather and a bit of abuse, hardware makers have watched shipments soar from 1.45 million in 2011 to an estimated five million plus this year as daring consumers document their escapades on digital video. 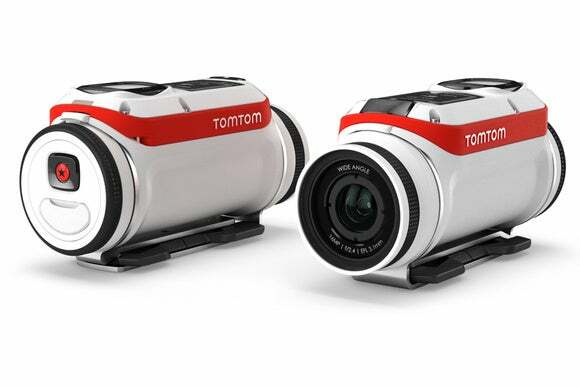 Best known for legendary GPS hardware and navigation apps, Netherlands-based TomTom soared into the action cam market earlier this year with Bandit (base model $400 on Amazon; premium pack $449 on Amazon), a diminutive shooter with unique hardware and software that’s heads and shoulders above competitors. Forget those square GoPro cameras—TomTom Bandit has style, good looks, and creates high-quality action videos. 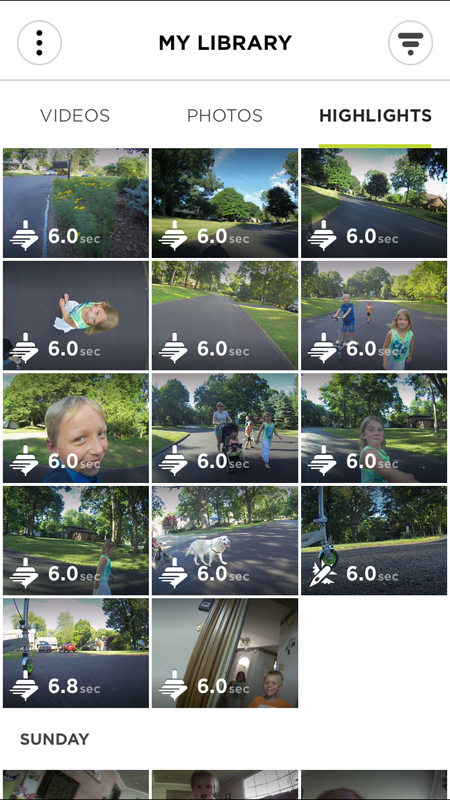 Overlays make edited videos more interesting by displaying recorded motion sensor data on screen. Surface mounts can be attached to any clean, dry surface with the included 3M VHB adhesive; I chose the base of my son’s three-wheel scooter for some nice ground-level shots. Bandit snaps onto the mount, unlocking easily with a pinch of two fingers on the bottom quick-release. 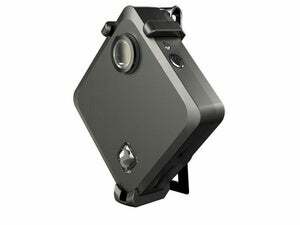 A roughly one-inch monochrome display provides quick access to settings and readable in direct sunlight, but like other action cams, there’s no viewfinder. The device powers up with a two-second press on the rear start button; to shut down, hold down the stop button on the top instead. The most unique aspect of the Bandit is what TomTom calls the Batt-Stick. Press a white switch on the back, turn the ring counter-clockwise, and pull to reveal a sealed 1900 mAh battery (good for up to three hours of 1080p shooting) with integrated USB 3.0 connector at the opposite end. There’s also a micro-SD slot on the side, but you’ll have to supply your own Class 10 card. Anything older is rejected for being too slow. When the action gets more intense, TomTom Bandit highlights new videos so they’ll take priority over other footage. This hardware limitation has been imposed because Bandit is capable of recording H.264-encoded MP4 videos in up to 4K quality—but sadly, only at a choppy 15 frames per second (fps). Other supported resolutions are less restrictive, including 30 or 60 fps 1080p, 60 or 120 fps 720p, and an oddball 2.7K 30 fps mode. The built-in microphone records mono audio using AAC compression at a 48k sampling rate. Picture quality is great, on par with the more expensive GoPro Hero4 Black (Amazon link). There are plenty of single, burst, and continuous photo modes (maxing out at 16 megapixels) as well as time-lapse and slow motion shooting options available. Bandit shoots either normal or wide angle views, but photos and resolutions higher than 1080p HD are limited to the latter. Although I didn’t have a dive lens cover to test it with, the latest software update enables automatic color and intensity when shooting underwater, adding a red filter to remove the garish blue and green typical from such footage. Not surprisingly, TomTom has also packed a ton of hardware into the Bandit: sensors for tracking G-force, speed, rotation, acceleration, and altitude; as well as Wi-Fi and Bluetooth for connecting to smartphones and tablets. 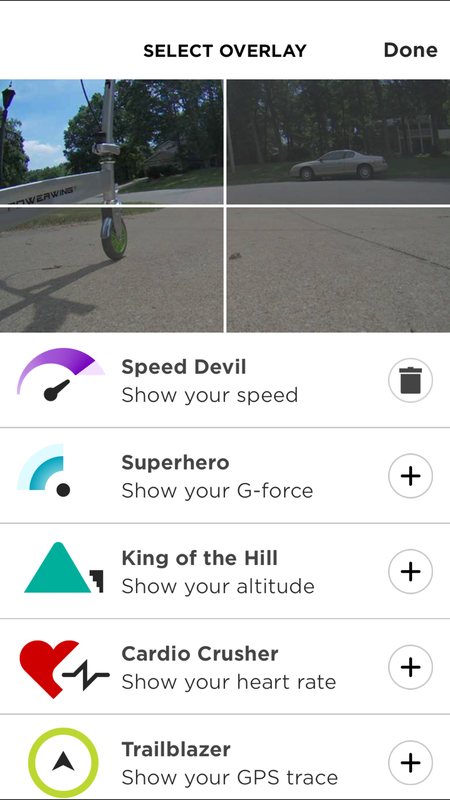 Creating a short video from your footage is as easy as shaking your iPhone, then spicing it up with overlays, music, and more. One of the biggest drawbacks of action cams is that it’s difficult to do anything with the footage out in the field. TomTom’s ingenious solution is as simple as shaking your connected iOS or Android device, which automatically creates a short edited “story” from raw footage. 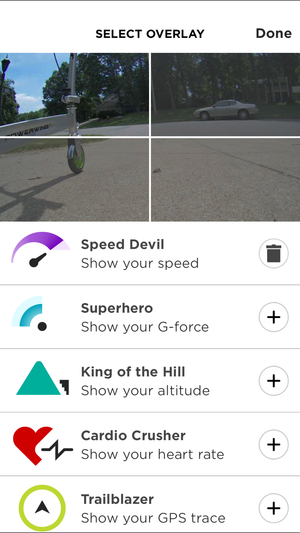 The mobile apps connect via Bandit’s own built-in Wi-Fi network for instant playback, live viewfinder, and camera control as footage is shot. 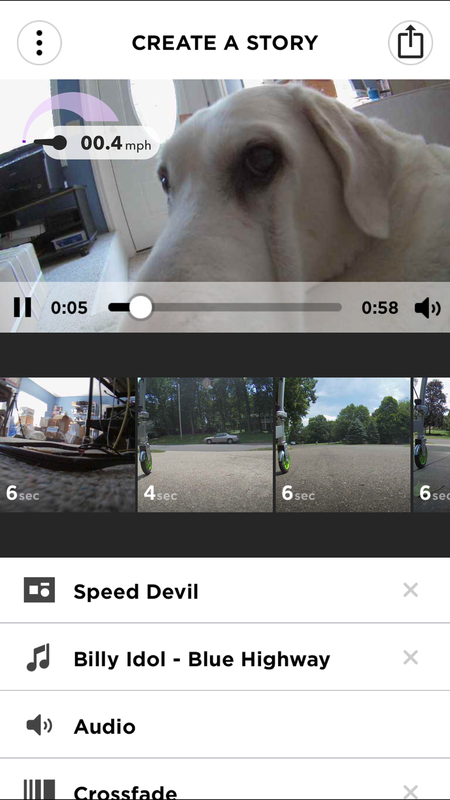 The motion sensors automatically tag recorded video as highlights when action becomes extreme, and that footage takes priority when creating stories; you can also manually mark highlights by pressing the start button. Stories can be spiced up with iTunes music, crossfades, and overlays, which display recorded motion data on-screen. My only quibble is that the overlay size changes with the video resolution, making it better suited to footage shot entirely in the same format. The Bandit app also occasionally got confused about cloud-based music, so be sure to download your desired tracks from the Music app prior to adding a soundtrack. Last but not least, you can share finished stories from the iOS 9 share extension to social networks and other apps. I discovered one annoying limitation, however: On my otherwise 4K-capable iPhone 6s Plus, the app refused to share a story containing 4K video, claiming my mobile device doesn’t support it. 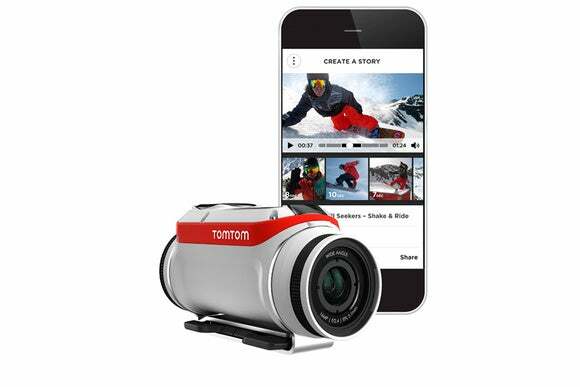 TomTom Bandit is an excellent action cam with software that’s superior to the competition, allowing adventurers to go from shoot to share in minutes.